Cadillac today unveiled the next-generation SRX crossover, a vehicle the company says is redesigned from the ground up and offers new, more-efficient engine choices. 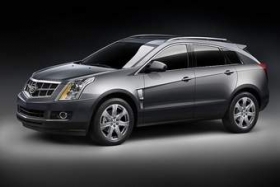 The 2010 SRX mid-size will be shown at the Detroit auto show next week. Cadillac says the SRX is aimed directly at Lexus' new RX crossover. Two new six-cylinder engines will be available: A 260-hp 3.0-liter direct-injected V6 will be standard, with a 300 hp, 2.8-liter turbo V6 as an option. A six-speed automatic transmission is standard. General Motors says fuel economy in the mid-20 mpg on the highway is expected, but testing isn't finished. The new crossover will be able to tow 3,500 pounds. All-wheel drive will be optional and will include an electronic limited-slip differential that sends torque as needed from side to side at the rear axle, as well as from the front to rear axle. Eighteen-inch wheels will be standard and 20-inch wheels optional. Cadillac unveiled the next-generation 2010 SRX Crossover today, featuring a completely new design and more-efficient, high-technology engine choices. The new SRX is a mid-size luxury crossover coming to the North American International Auto Show next week. The 2010 SRX is designed for efficient performance, including the choice of two high-tech six-cylinder engines that are new to Cadillac - the smallest-displacement engines it offers in North America. A new, 3.0L direct injected V-6 engine is standard and a new, 2.8L turbocharged V-6 is optional. Both engines employ technology that helps produce strong performance that is typical of larger-displacement engines. Direct injection enables a 25-percent reduction in hydrocarbon emissions. Fuel economy in the mid-20s on the highway is expected, but testing isn't complete. A multi-piece shield grille and Cadillac's iconic vertical headlamps - with light pipe technology and available adaptive forward lighting - are the face of the SRX. They blend into a tightly wrapped, sweeping body that tapers downward at the rear, giving the vehicle a sporty profile, Dean said. The SRX is powered by a new, fuel-efficient direct injected 3.0L V-6 that delivers an estimated 260 horsepower (193 kW) and is paired with a six-speed automatic transmission. Direct injection results in more power, better fuel economy and lower emissions, all will a smaller-displacement package. As a result, the new V-6 engine is expected to raise the SRX's standard power rating by 5 horsepower, while achieving an estimated 10-15-percent fuel economy improvement.